“Fushigi Yuugi: The Mysterious Play” is a 52-episode shojo/girl’s coming of age, TV anime released from 1995 through 1996. Its Art Director/Supervision was done by Yuji Ikeda, Art Director for “Demon City Shinjuku”, “Arslan”, several “Dragonball Z” movies, and Art Design/Establishment for “Gungrave”. Junior High School Senior, Miaka Yuki, is about to take her entrance exams to try to get into the same High School as her bestety best friend in the Whole Wide World, Yui Hongo. While at the library, the mystic book, “The Universe of the Four Gods” (classic Anime reference to Chinese mythology’s Four Gods of Heaven) calls to Miaka. Miaka and Yui are magically transported into the story within the book, and into the kingdom of Konan (praying to Krom! ?… Uh…No). Konan is ruled by gleaming, longhaired, bishie boy, Hotohori; and is currently at war with the kingdom of Kutou, and its scarily-manly, testosterone possessing, bearded, harem-owning, despot. The peaceful land of Konan’s only hope of defeating the superior military might of Kutou is to summon their local area’s god, the Phoenix, Suzaku. To summon Suzaku, Miaka must take on the role of the Priestess of Suzaku and gather the Seven “Pretty Boy” Stars of Suzaku. 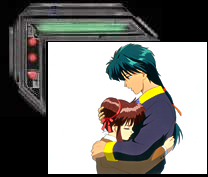 Having been defended by him when she first arrived in the book’s world, Miaka has already met the mostest dreamiest boy evahhh, Tamahome; who just happens to be one of these seven protectors. Feeling forgotten, and jealous of Miaka’s new boyfriend, Yui allies herself with blonde, girly-guy, sadistic meanie, Nakago. And Yui turns out to be the competition: Kutou’s own Priestess of Seiryuu (he’s kinda like Suzaku…’cept he’s a dragon, and his warriors are made up of not-very-nice, skanky people, of both genders)! Will Miaka be able to: 1. Regain/Maintain her friendship with Yui? 2. Get/Stay together with Tamahome? and 3. Stop crying, and save Konan? With its plot, and cardboard cut-out, archetypical characters, meticulously crafted for and to the tastes of thirteen-year-old girls, “Fushigi Yuugi” still can be enjoyed by others, too, through its very beautiful look and character designs, broad physical humor, some well done fight sequences, and one multi-layered character, Nuriko.